I woke in the earliest morning, starlight overhead, and my eyes first saw the reflected firelight on the canyon wall across the creek from last night's cooking fire. It was around 4:30am. I crawled out of my sleeping bag with three things on my mind: the upcoming day's ride, Billy tea, and Damper. The upcoming ride I knew would probably be easier than the past few days as we gradually descended towards the Mitchell River and out of the rough Dividing Range. Easier? No rides are easy in this terrain. Steep climbs remained, I knew, but the net elevation change would be a decrease. It was the Damper and Billy tea, which mostly entered my waking consciousness. We'll talk about Billy tea later, but it's Damper I want to share with you now. Crister is writing about how to cook Damper. What I'll talk about is how much we love it! 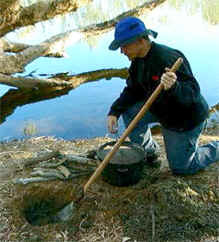 Damper is a type of bread cooked in a camp stove, which is put in a hole in the ground and covered with coals. We can't buy any bread out here, because there's no place to buy anything. Damper is what the miner's survived on, and it's the food we've come to love the best. It's the third thing which entered my waking, and hungry mind and body this morning. We'd cooked enough Damper last night to feed all ten of us with our stew, and had enough left over to satisfy us through starlight breakfast and mid-morning tea 30 kms down the track. We ate toasted Damper by the dawn's first light, cooked over the coals after we packed our tents and organized our personal gear. Peanut Butter, Apricot Jam and Butter heightened the gustatory experience. Gustatory experience? We're just plain hungry, famished after all our cycling, and Damper is what we need to fill our stomachs. Bread, heaps of bread. At break time up on a mountain looking over the Mitchell River, we chowed-down on the rest of last night's lump of Damper. And now, in the starlit evening at our camp on the banks of the Mitchell River, after panning for gold, fishing, washing, swimming and relaxing, we're cooking up Damper again. 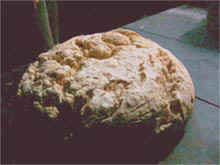 It's wonderful.. Read Crister's and Mike's updates in 'Education' for how to cook your own Damper! "So, what happens if someone comes off their bike and breaks a leg? scenario we should plan for." - planning meeting, Jowelbinna. After a relatively shambolic first week, as one might reasonably expect of a group of strangers coming together to ride across the wilds of Australia, we needed to pull our socks up for the next section of the ride: the notorious Maytown track leading from Jowelbinna along one of the main arteries to the now ghostown of Maytown of the Palmer River Goldfield. We could expect no vehicular support from John, and the chances of getting a vehicle up there in a hurry, even if we were able to alert someone, were slim. So were someone were to get seriously injured, we should be prepared for a good 2-day hike down the mountain with a makeshift stretcher. structure and 'what if' safety mechanisms for every possible occurrence is rather foreign to me. Not only have previous expedition participants been well known to me as friends before any section they might join up for - thereby making internal decision making that much easier - but the country we're passing through is more rugged and inhospitable than any I've previously passed through. So a good 3-4 hours was spent on our day off in Jowelbinna in planning meetings: calculating and providing enough food and water for the 2-days it could potentially take us to complete the 40km ride (if something was to go wrong); re-packing the medical kits with splints and antibiotics; packing a tree saw for cutting poles for a stretcher etc etc. This process, although time consuming and all together rather tedious at the time, is always a solid investment in allowing things to run smoothly on the day. An extra half an hour going over the plan just one more time so everyone is clear about things like rendezvous points and what to do if they get lost etc, is a small price to pay in comparison to the disastrous mess that a large group can get into once out in the field. morning on the banks of the Palmer River it seems like a week since we started hauling our bikes and BOB trailers through the first 3kms of sand to the foot of the first grade. I won't go into too much detail now, as you'll be able to see all the sweat, tears, laughs, punctures and wipe-outs on the TV documentary coming out at the end of all this. Suffice to say it proved the most incredible track to ride, with its twists and turns, hair-raising descents and backbreaking inclines. How the early prospectors made it along this track with their bullock drawn loads of mining equipment and supplies defeats the imagination. But by the time we limped into camp in the dark after 13 hours out on the road we were all totally gaa-gaa with fatigue, almost too tired to congratulate ourselves on a pretty full-on achievement, certainly to tired to write an update for the website - hence this being a day late. We now have a day off to lick our wounds before pushing onto Bellevue at first light tomorrow morning. Mike needs some time to recover from heat-fatigue, and the bikes and BOB trailers are so badly battered from the abuse sustained from the track it'll take a fair amount of time throughout the day to get our trusty mounts back into some sort of workable order. We also plan to take some time to explore the local town with its mining past, now only visible in the mangled hulks of old mining equipment and open mine-shafts that litter the once bustling hillsides all around us. "Did you see the wallaby?" came the excited cry from up ahead. 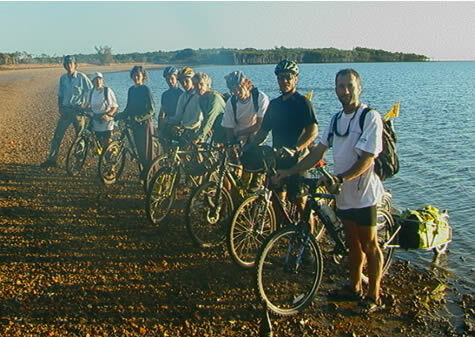 A ripple of excitement ran through the group as we filtered in for a brief stop alongside the road. "Yeah, he was by the termite mound just off the side of the road…" "Oh, please! You've been calling out wallaby sightings all day and we've never seen one at all…There are NO wallabies here!" After a variety of biking tracks, today was called off for much needed bike repairs, reorganizing kit, and general regrouping. Our campsite is located at the Jowalbinna Bush Camp, home to one of many Quinkan Rock Art galleries. Carved figures in the rock depict ancient Aboriginal art. Animal paintings of kangaroos, wallabies, and emus, to name a few, adorn the walls of recessed areas in the rock groupings. Among the paintings are the good and bad spiritual figures, the 'good' being heroes of old, while the 'bad' are depicted by spirit figures such as the Quinkans. As dusk was falling, we hiked the steep, narrow trail to the rocks, standing as sentinels above the valley floor. Climbing among the rock faces, the paintings subtly appear, camouflaged until the eye discerns the outline of a solitary emu. The figure of a woman becomes apparent as the eye scans the rock wall. Fading sunlight calls an end to the hike. Making our way slowly down the rocky trail, we are lost in thought about the ancient paintings we've been priviledged to see. Suddenly, we pull up, a slight movement attracting our attention. A small wallaby silently moves off toward the rock sentinels. He pauses to peer at us, blending into his surroundings. At last, he's made his presence known and in just the perfect spot! Last night ended amongst the relative luxuries of the Laura campsite - showers, beers, a telephone box and good food. Today was a harder slog: long sandy road leading to our first real show-stopping challenge. The Maytown track is an old gold rush trail built in the late 1870s to allow horse-drawn stagecoaches passage across the Great Dividing Range to the then-booming town of Maytown. I cannot imagine how they got horses and carriages up the steep rocky climbs and down the deep sandy ruts. The terrain is challenging, to say the least. As one of the expedition cameramen, I had stayed behind in the morning to interview John, our support vehicle driver. We were trying to catch up with the rest of the team in our four-wheel drive when it started to become obvious we weren't going to get our large supply van any further. The track had been built almost the exact width to accommodate a stagecoach and our van just that little bit wider. Since the bike crew had already gone ahead, I found myself loading my bike up with some food and water and taking off up the hill alone. I suddenly realized how wild this environment is. My high tech bike and years of cycling were quickly humbled by the heat, surface and incline - one mistake out here and it's all over. I caught up with rest of the cyclists on the first ridge a tired and hungry lot. Mike had the worst day of all; his bottom bracket (the bearing assembly that holds the pedal mechanism together) had given up the ghost. He'd been walking for about 20km pushing his bike up and down the range like a sick relative. We built a fire, had lunch, and had to make a crunch decision: without the support truck we didn't have enough water, food and equipment to go on. So we turned the whole show around and started a hair-raising decent back down the hill, flying down the rocks and skidding through the sand. 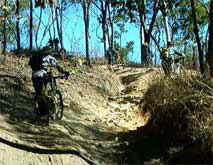 Backtracking was a little demoralizing but this was great riding. Jim was managing to maneuver his BOB trailer through the technical twists and turns. Josh and Crister blasted ahead jumping obstacles and laughing all the way. The rest of us slipped and slid back; our expressions alternating between happy grins, intense concentration, and a slight furrowed brow - knowing we had to climb back here another day. Our slightly 'free-form' planning and subsequent backtracking made us realize us more planning and communication is going to be needed to pull this thing off successfully. We finished the day figuring out how to make a second attempt on the Maytown track and collapsing into our sleeping bags. expedition leg through Australia. May through November is Australia's dry season. I have heard many say it is also Australia's winter and through the months of November to May is what Australians call the "wet." massive amounts of water that surges down these mountains during the wet season would make passing through them extremely dangerous. Many of the riverbeds we have crossed in the dry season have told the tale and have shown us their scares. Trees as tall as 50 feet and 5 feet across at their roots have been left lying in the dry riverbeds far from where they were growing. 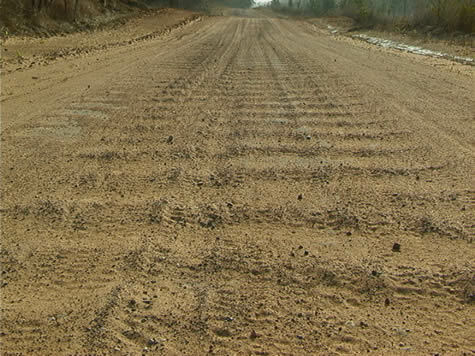 The dirt roads we have been traveling show how, during the wet, they can easily be washed away to where even a Mountain bike would have trouble passing. Water, along with wind, is Australia's main sources of erosion. It continually changes the look of this beautiful country. We have been privileged to see the effects of these amazing rivers first hand. And though many of the riverbeds we have gone over are all but dry, we have still had some fun experiences trying to cross them in this time of the dry season. Today started out with a late start leaving approximately 1 hour after the pre-determined time, we are getting better. The first part of the trip was only a little sandy and rather easy to cycle on. The first corrugations started two hours before lunch, they are painfully slow to ride on. Lunchtime arrived; the truck turned up just when the rest of the group came down into the Normanby River. We started the noodles and the porridge when Chris decides to go for a drive through the creek, for reasons that bewildered us. The car got bogged. When John attempted to tow the car out of the creek he became rather stuck in the mud. Tourist and locals were passing every five or so minutes. A couple of nice tourists decided that they could give us a hand towing the truck out. That was successful. Though we still had a car in the middle of the river, after an hour and a half and a lot of talking in French, John got the car unstuck. The afternoon had corrugations so large that people were becoming lost from sight. Bulldust was common and our bikes were sliding all over the place. Cars were passing us frequently and throwing dirt all over us. Later in the afternoon on a really, really long straight road the sun became my main enemy, the sun was wining the fight. Everyone battled on and the sun went behind the clouds. We pressed on over even more corrugations for about an hour after the end of the straight and even though we had a large time delay at lunch, we arrived at the camp safe and sound. Overland Australia is finally underway! At 08.45 this morning we posed for a departure photo with our rear wheels in the Pacific Ocean before wobbling off across the sand in the general direction of Darwin. The plan was to christen the journey with a bottle of champagne, but a last minute flash of inspiration - in keeping with Australian culture - meant a can of "VB" (Victoria Bitter) was cracked open on my Cannondale frame and passed down the line instead. The next time our wheel bearings will feel the soothing effects of salt water will be when we ride our bikes off Darwin pier, 86 days from now. 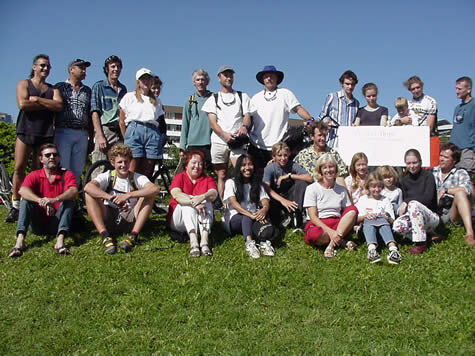 ago in 1997 on the overland bike expedition through Central America to Peru. Back then I was riding a 1968 Raleigh 3-speed with well over 150 lbs. of kit stuffed into 4panniers lashed to each corner of the bike. I walked more hills than I could ride up and spent many, many hours sitting by the side of the road repairing punctures to hopelessly inadequate tires. Today the majority of us pushed away on spanking new Cannondales mountain bikes (Jekyll 600's + 700's) with both front and rear suspension. And boy did we need them! The road-leading south from the mouth of the Starcke River, where the Pacific leg of the circumnavigation officially ends, can only be described as dreadful. During the wet season the existing road is completely washed away in places and vehicles have to find alternative routes to keep moving. The result in the dry season is a mish-mash of hard, compacted wheel ruts that wind and weave their way through the bush. For our Mitsubishi support vehicle this presents challenging terrain that John (the driver) has to negotiate at a slow, controlled pace. For the bikes it's great fun. Much of the 55km we pedaled today were on this uneven but engaging terrain. 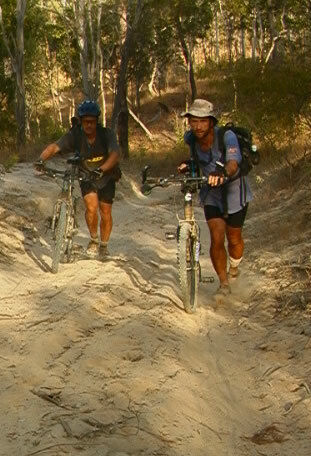 Unlike pedaling on a metalled road we found ourselves having to concentrate on every piece of ground immediately ahead of us, responding as best we could to bumps, ruts, rocks or fallen branches lain across the track. Dog tired - must send this before I fall asleep at the keyboard…. but lost to the extent to which food and water become major concerns. range by the time we tried to make contact. We were on our own. group. They had the water, food, maps and fuel and in this "remote"
wilderness even the most experienced guides will find themselves lost. 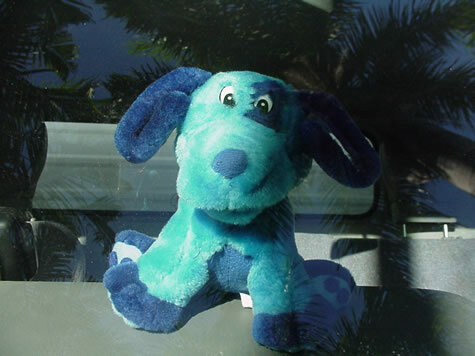 On the dash of x360's Mitsubishi 4wd Cantor truck sits our mascot, a small stuffed dog named "Blue." We like to keep Blue's floppy ears tucked up underneath themselves. On the first few kilometers outside of Cooktown where the bitumen ends, Blue's ears stayed nice and neat, right where we stuck 'em. The back of the truck was nice and neat, too, loaded to the gills with 44 gallons of petrol, 75 gallons of water, three months of food and supplies, freezer and refrigeration units, 12 mtn. Bikes, 6 B.O.B. cycle trailers, two generators and an air compressor, art supplies, three computers and heaps of electronic and satellite communications gear. The x360 team was looking fairly nice and neat, too, after an evening's drive up from Cairns along the coast road past Cape Tribulation and a comfy sleep and shower in a caravan park, the last we'll see for a thousand kilometers. Before long, nothing and nobody looked 'nice and neat', and Blue's ears were a hang-dog's length down the side of his face; his blue color began a slow change towards a Bull Dust shade of earthen red. The plan was to 'slip up' to the Starke River outlet, a mangrove forested delta with good fishing and a few 'Salties,' salt-water crocodiles. We had three vehicles, a Toyota Landcruiser, a Toyota Hilux, and our Mitsubishi for the 10 members of x360. From this point, where Jason's trans-Pacific crossing ended, we will begin cycling Southwest towards the town of Laura and the infamous Maytown track. Our road was a rough one, yesterday, real rough, and Blue witnessed a few skillful maneuvers to keep the vehicle upright and moving forward. The 130k adventure took about 6 hours, with about half of that on the 'main' road where we could keep up an average 60 kph. Darkness settled in when we were still well out in the bush, and overhanging branches, deep eroded washouts, soft sand and windscreen-high grasses down the middle of the track kept the winch and Bully Bar in use, and Blue's eyes wide open and ears un-tucked. By starlight, with the new crescent moon setting in the west, Blue's silhouetted form led us into camp, our three vehicles circling-up for a camp set-up. Bush wood stoked the fire and within a few hours tents were set-up, dinner of salad, potatoes and roast chicken prepared and consumed, and Blue rested quietly on the dash, ears freshly tucked back into place as we all slipped-off to sleep. Today is a final prep and organize day: bikes put together, a few transport damages repaired, the back of Blue's truck re-organized. The team has had several meetings to plan strategies for navigation and communication in the outback. Everyone is trained in using the three GPS units and finding their location on the topographical map. Strategies have been laid-out for morning departures, meals and communications during the rides. In the morning Blue will watch the x360 team turn its back on the Coral Sea and begin the long ride leading to Alice Springs and Darwin. Keep your ears open for news of further adventures. As many hiking trips as I have taken in my home state of Utah, I have never been concerned about getting lost. Not just lost for a moment but lost to the extent to which food and water become major concerns. I have read a lot about Australia's terrain. The majority of the landscape is considered "remote", with tracks stretching for hundreds of kilometers and little or no sign of civilization. I have used the word "remote" in many descriptive stories and to do the word justice I have learned first hand today that the next time I use "remote" in a story I had better be talking about Australia's Outback. Next to Australia's Outback, getting in "remote" areas in Utah is the equivalent of getting lost in a downtown mall. Let me tell you how I know. Day 1 was to be an easy day. We had planned to get up in the morning, take in the re-enactment of Captain Cook's landing on the Australian shores with the Endeavour and its crew in Cooktown, pack up our three vehicles and head for our expedition starting point on the mouth of the Starke River. It was to be a trip that should have taken two hours on rough Outback trails. Trails, not roads. However that was not at all how it went. I was in the smallest of the three vehicles with Bel, Josh and our driver, Chris. We decided to go ahead of our support vehicle, and though Chris had traveled this route before, we still got terribly lost. We had shortwave radios among the three vehicles, but we were out of range by the time we tried to make contact. We were on our own. With no water, maps, 3 quarters of fuel and a box of breakfast bars we would enjoy a ride that was like being on the oldest, meanest Roller Coaster you can imagine for seven hours. From; racing against the tide on the 20 mile beach of Cape Flattery, almost getting stuck in knee high sand and waist high river crossings, driving in the dark in a pitch black jungle to stopping every so often to check for tire marks that may or may not be the tracks of our support vehicles dual rear tires, we finally found our camp on the Starke River. It could easily have been longer than that. We discovered that the two other vehicles found themselves lost many times as well, however we made the most critical error. We left the group. They had the water, food, maps and fuel and in this "remote" wilderness even the most experienced guides will find themselves lost. To go out alone is indeed risking it all. Our lesson could have been more severe, but I can tell you that I will never venture away from the group again. Hi, my name is Crister Brady. I’m the youngest member on the expedition and this is my first time in Australia. I arrived here in Cairns on Wednesday and it’s been non-stop ever since! John Andrews, a Cairns local, greeted my dad and I in our Mitsubishi support vehicle aptly named Clue for the stuffed animal on the dashboard. Mike Roney from Utah and April from Colorado were the next members we met. Our home base of the expedition is John and Norlia’s house, which is decorated by their awesome artwork. began sorting and organizing food…food! We must have a couple tons! But, I bet we will be eating a lot more than anyone can imagine once we get moving. and a climate that is incredibly pleasant! Around four, Jason, Bel, and Todd arrived. We heard about their adventures while kayaking and talked about some minor logistics. 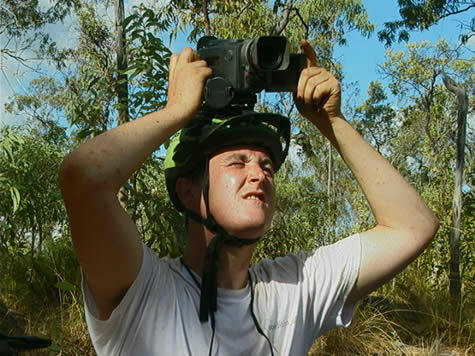 Josh, a 19 year old from Cairns who will join the expedition, also arrived soon after. Around eight we all had a delicious pasta dinner cooked by Norlia and then had a two-hour meeting concerning major logistics. During the meeting we tried to imagine what a normal day (if there will be such a thing) will look like, and tried to plan around the facts recovered from that. After a long day we went to sleep around midnight. Today we have been packing, packing, and packing the vehicle. A T.V. crew from a local station did some interviews and a few biking shots, which was pretty fun. 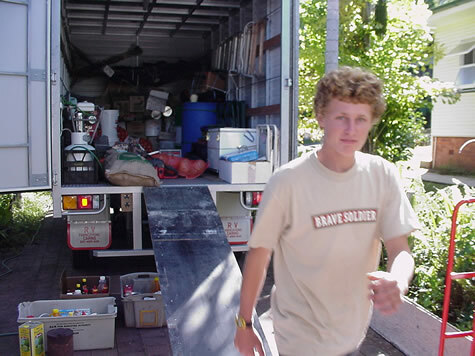 The packing of the vehicle involves careful organization and mostly “managed” by John who does an awesome job at it! The group seems to be coming together well, and everyone seems very ready for the 3 months that lay in front of us! Yahoo!!!!!! !